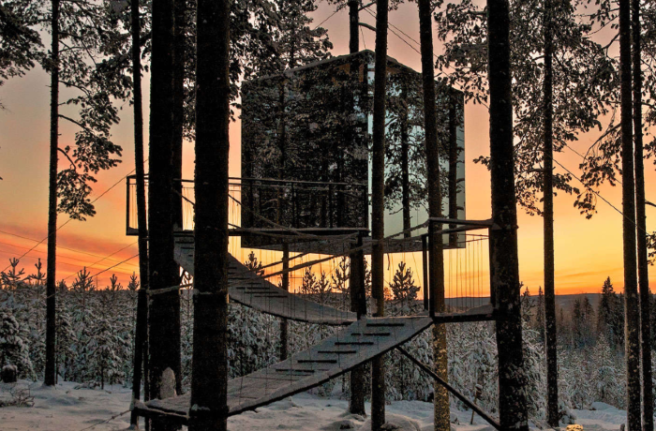 Check out this breathtaking TREE hotel in the Swedish forest | SHEmazing! Finding the perfect getaway can be a challenging business; you want to feel at ease, relaxed and replenished, but where can you find a spot with the perfect amount of privacy mingled with life-changing views? Well, this tree hotel in the northern Swedish forests offers rooms perched among the pines with an awesome aesthetic landscape to boot. It's essentially something straight out of a dream, with different room types like the Bird's Nest, The Cabin and the UFO (legit a flying saucer). Each of the seven available rooms are all modern variations of tree houses designed by Scandinavian architects, which allow you to bond with nature in the lap of luxury. The Tree Hotel is so private and remote that you have to fly all the way from Stockholm to the Lulea Airport, and then the hotel organises for a car to collect you, or for a train journey. You can totally disconnect and enjoy the natural lifestyle, as well as possessing that crucial WiFi in case you need to post an emergency Instagram of your incredible surroundings. Oh. it also has HEATED FLOORS and towers. There's also a gorgeous restaurant on the property which makes sure to serve only local ingredients. Daytime activities include dog sled tours, ice fishing and photography walks. You might need to tap into your savings to afford this one, however. Prices range from about €113 to €680 per night, depending on the time of year and type of room.